With some 23 million monthly visitors, San Francisco-based Trulia is the second most popular real estate website after Zillow, at 36 million, according to analytics company eBizMBA. The two sites may seem much alike to users, and no wonder: Trulia was purchased by Zillow Group in a $2.5 billion deal in February 2015. Combined, the companies’ aim is to become the online powerhouse of the home listings industry. Of the two, Trulia is more focused on the consumer home search, while Zillow looks at the broader world of home ownership — buying, selling, renting, financing and remodeling. After the merger, Trulia added apartment listings from Zillow’s network, as well as a lineup of mortgage products. Still, the Trulia brand, site and apps remain distinct. Here’s a look at how house hunting works on Trulia. An engaging experience. It’s intuitive and fun to use your phone to tap your way through its 3.5 million property listings. Trulia gets for-sale listings through Zillow’s network of more than 235 multiple listings services (MLS). It also gets them directly from brokers, agents and website vendors. Useful filters. Trulia’s app serves up collections of potentially interesting homes in your area based on themes like “updated kitchens” or “safe areas.” You’re presented with an array of large photos right away. Users love it. Users of both Apple and Android devices applaud Trulia’s app. In user ratings on app stores Google Play and Apple’s App Store, Trulia beat or tied all other leading real estate apps, including Zillow, Redfin, Homes.com and Movoto, according to a survey by real estate tech specialists Clareity Consulting. Ease of saving and sharing. Tap a heart icon on a photo corner to save the houses you like and collect them on a board, Pinterest-style. Invite friends to share your boards through email or Facebook. Apps for everyone. Renters have their own app, called Trulia Rentals. There’s also Trulia for Agents and a version for Apple Watch wearers. Trulia Estimates Calculates market prices for houses using sales and public house data, with some degree of accuracy. As with other online estimates, the range of accuracy for any particular house depends on whatever data went into the algorithm — meaning it’s best to take it with a grain of salt. Neighborhood data Visualize crime statistics, school data and more on a color- coded map. Some of the maps, such as one displaying affordability, were harder to interpret than others. The pricing data, when translated into colors, is not entirely intuitive. Shareable boards to pin your favorites Launched in March, this feature is an engaging way to earmark your favorite properties and share by email or on social media. You must sign in using your email or Facebook account to use this feature, which is especially cumbersome if you’re switching between the website and app. Mobile apps The Trulia app is top-rated, full-featured and very user-friendly if you’re searching on the go. Renters and real estate agents have their own Trulia apps. App does feature ads, though they are relatively unobtrusive. As part of Zillow Group, Trulia gets ad revenue from agents who pay to have their property listings featured prominently in search results or to promote their profiles. It also connects consumers with local mortgage lenders, collecting fees from lenders. As a whole, Zillow Group generated revenue of $171 million in the second quarter of 2015. Consumers complained in the past that Trulia’s app was cluttered with too many banner ads, prompting a change to a cleaner user experience. You’ll still see ads on the app, but they are relatively unobtrusive and easy to ignore. Great user experience. Trulia makes it very easy to browse homes for sale, even from your car as you visit neighborhoods. Once you enter your ZIP code, you can search by price range and home attributes such as square footage or number of bedrooms and bathrooms. There are specialized filters, too, such as the year the home was built or whether the price has been reduced. If you’re looking for something to do on a Sunday, you can search for open houses in your area. Like other real estate sites, Trulia provides home facts from public records. Financial facts at your fingertips. In addition to the asking price, Trulia provides its own Trulia Estimate of what the market value of a particular home is. Based on a proprietary algorithm and publicly available information, the estimate is sometimes off by a quite a bit; but it can be a useful benchmark, especially if you use it mostly as a guide along with other online estimates. If you’re considering bidding for a house, you can easily search for comparable sales in your market with the “sold” filter. 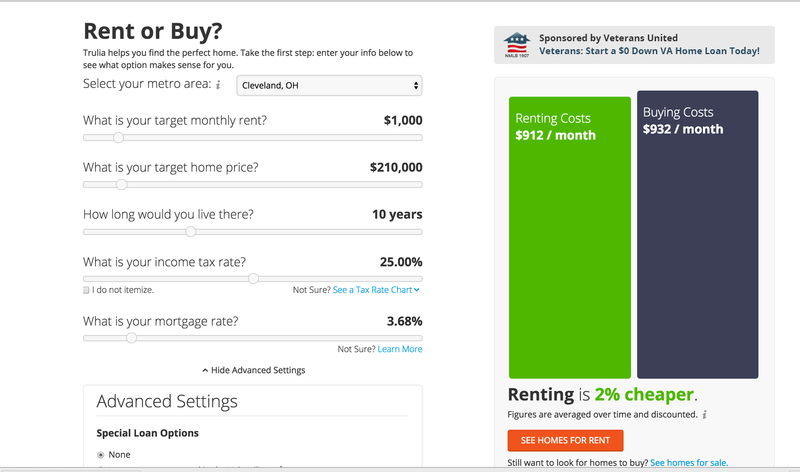 A cool “rent versus buy” tool helps you understand how each option adds up for your situation over a period of time — say, seven years — accounting for factors like your income tax rate and mortgage interest rate. Each listing displays an estimated mortgage payment based on generic assumptions. You can search for mortgage lenders and request information or call a broker directly from the app. If you create an account, you can enter personal financial information like your income and creditworthiness. When you’re shopping for mortgages, you can allow Trulia to forward your information to lenders. All about the neighborhood. For those who are thinking about relocating to a new city, Trulia is useful for researching neighborhoods and getting a feel for an area. Its maps are a fun way to visualize statistical data for various neighborhoods. For your target neighborhood, you can tap to view crime statistics, school locations and ratings from Greatschools.org, restaurant and amenity locations from Yelp, affordability metrics such as sale prices per square foot and Trulia Estimates, and demographic information such as the percentages of college-educated residents and owner-occupied homes. You can even investigate the risk of natural hazards, like tornadoes and earthquakes, all mapped in color-coded displays. Trulia displays names and contact information for agents in your area and highlights those who are top sellers, or have another speciality, like relocation. It’s an easy way to size up basic information about an agent. You can see right away how many homes they’ve sold, how many reviews they have and their star rating based on client input. Remember that agents can pay to place their profiles in proximity to a listing. As with any type of online review, be a little skeptical when reading and disregard comments that seem unduly biased. 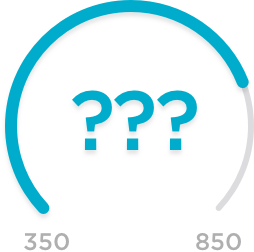 A common complaint about home value estimates on the Web is that they seem to vary wildly: Price estimates for the same house may differ by tens of thousands of dollars from site to site. As with other websites, Trulia’s estimates are only as good as the information that goes into computing them, including recent sales of similar homes and housing data from public records. And relevant information may be left out of the calculations, such as a decline in value due to neglect and poor maintenance. Ultimately, online estimates may be more accurate in the aggregate than in specific cases. Use the estimates as a benchmark, and compare estimates from a few different sites. For an accurate appraisal, it’s still better to talk to a human — a real estate agent or a professional appraiser. 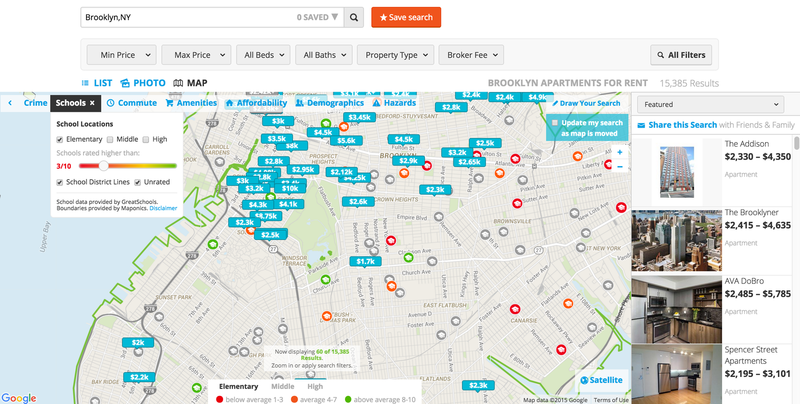 Trulia admits its algorithms have their limits, and it displays Trulia Estimates only for neighborhoods for which it has reasonably good data. As of January 2015, the company said it had price estimates for more than 50 million single family houses, condos and townhouses. Trulia gets credit for reporting the differences between its past estimates and the actual sales prices for homes, noting how many sales were within 5% to 20% of the Trulia Estimate. 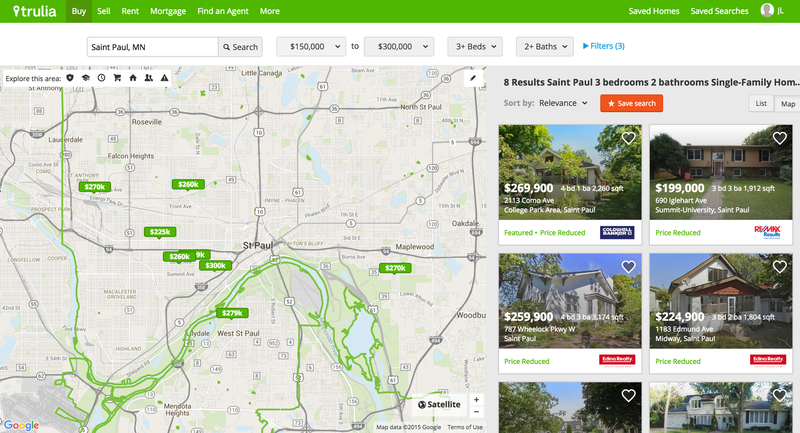 Though not the biggest player in the home listing market, Trulia has a very appealing website and mobile apps. It’s easy to access home facts and pricing details when you’re looking at properties on the go. At home, you can delve into research on neighborhood statistics and use the site’s financial tools to analyze a home’s affordability relative to your household income, tax bracket and credit scores. While competitor Realtor.com has more MLS data, Trulia — through Zillow — has developed a network of MLS partners and also gets listings from other sources. Trulia has tons of listings and a wealth of useful features and can be downright fun to play around on. The truth is, many house hunters probably hop between different real estate sites to compile information. If you’re serious about buying a home, it can be worthwhile to set up a free Trulia account to take advantage of more of its features, including the ability to save your searches, share interesting properties and even research mortgage options.